Prepare yourself for the epitome of adventure and prestige with not one but two National Geographic Lodges in Ecuador, back-to-back! 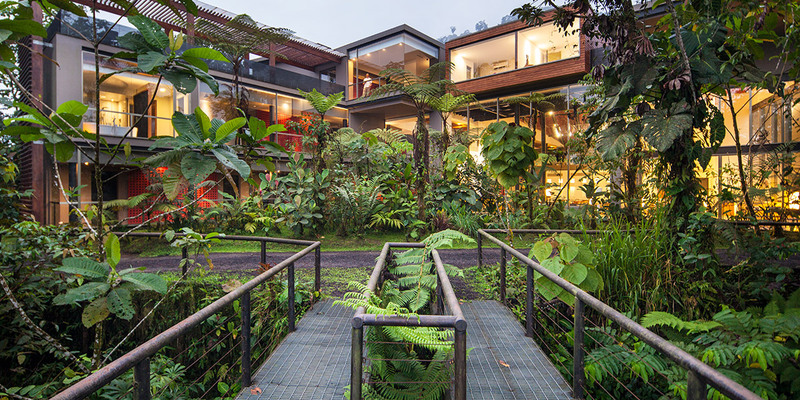 Following a brief visit, you’ll head down from the historic highlands of Quito into the lush and captivating, nearby cloud forest to discover Mashpi Lodge – a cocoon of luxury planted amidst it all. After that, prepare yourself for the wonders that await right at your doorstep over at the Finch Bay Galapagos Hotel – a wholly enriching land and sea experience of Ecuador and the Galapagos islands! *Please note: Exact islands and excursions will be confirmed by your Destination Expert. Welcome to Quito, Ecuador! At the airport, you will be greeted by a member of our team who will assist you with your luggage and transfer to the Hilton Colon Hotel. During the ride, you will receive a brief introduction of Quito and Ecuador along with valuable information regarding your stay in the country. 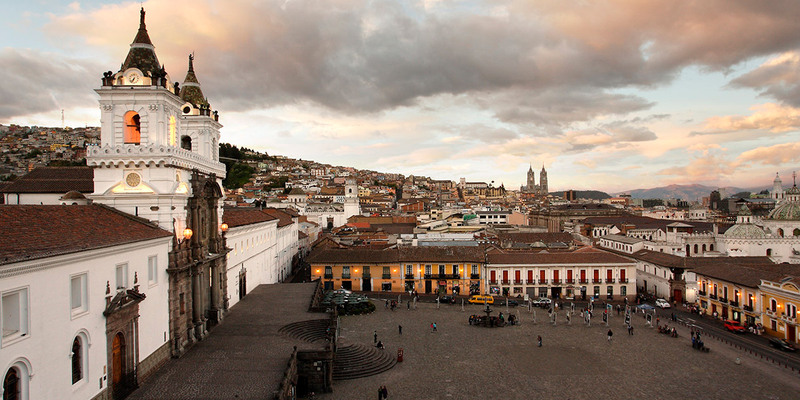 On this day, you’ll visit the Historic Center of Quito. This marvelous place was declared a UNESCO World Heritage Site in 1978. On this day, we will stroll through Independence Plaza where we’ll see the Cathedral, the Presidential Palace, the Municipal Building and the Archbishop’s Palace. After that, we visit La Compañia de Jesus and San Francisco Church and Convent with their impressive, gilded and baroque interiors, respectively. 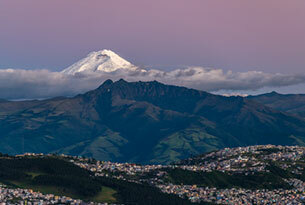 The tour ends at a lookout point with a spectacular view of Quito. At the end of the tour you’ll be taken back to the Hilton Colon Hotel. Overnight in Quito. Rise and shine for the next part of your adventure! 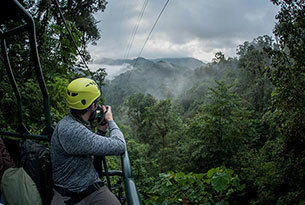 Guests will be picked up at approximately 8:00 a.m. and taken to the Mashpi Reserve – a 1,300 hectare (3,200 acre) swath of cloud and rainforest that is located within the Metropolitan District of Quito. Upon arrival, Mashpi’s staff will take your luggage to your room. Shortly after that, you’ll be invited to lunch followed by an introductory briefing regarding the Lodge. After that, it’s time to head out and explore! Throughout the following days at Mashpi Lodge, you will get to have a guided experience of the natural wonders of the Reserve while staying at the spectacular, National Unique Lodge of the World that is Mashpi Lodge. The sweet songs of the birds around the Lodge in the early morning will help you begin this new day with a smile! On this morning, you’ll have different options for how you wish to begin: you can either start at the crack of dawn for a hike around the surrounding forest with your guide. Alternatively, you can choose to have a relaxing morning and sleep-in for a little longer, enjoy breakfast at the restaurant and treat yourself to a relaxing massage at our Samay Wellness Center. 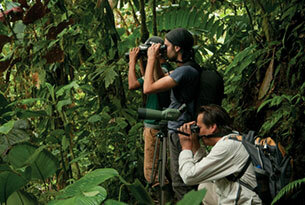 After that, you can head out into the forest with your guide, where an exciting day of discovery in the forest awaits! 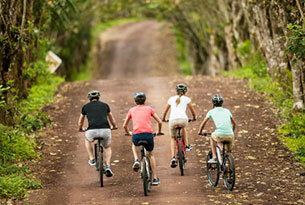 At the end of your excursions, you’ll head back to the Lodge in time for dinner. Overnight at Mashpi Lodge. 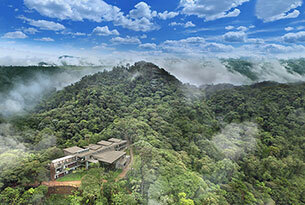 Bid farewell to Mashpi Lodge! On this day, you’ll take a transfer to Quito’s airport in time for you to catch your flight to the Galapagos. 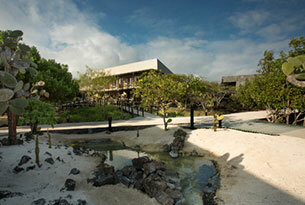 Days 7 to 10: Finch Bay Galapagos Hotel Excursions / Transfer to Airport / Farewell! Throughout the next three days, you’ll be free to choose from a plethora of Finch Bay’s daily activity options. These include: visits to nearby islands, visits to the Highlands of Santa Cruz, and visits to Tortuga Bay and the Charles Darwin Research Station. For more information on these activities, be sure to view the “Full-day Land Activity Options” and “Yacht Exploration Options” tabs below! On the final day, you’ll enjoy breakfast and hop on your transfer to the airport, from which point you’ll take a flight to the mainland and connect to your international flight home! Farewell! Enjoy the gentle Giant Galapagos Tortoises as slowly make their way through the dense foliage and bush of the highlands of Santa Cruz. The area is teeming with life and spectacular lava tunnels. The stunning, white sand beach of Tortuga Bay is considered by many to be the most beautiful stretch of coast in the Galapagos archipelago. 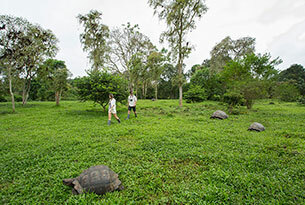 The Research Station is an interpretation center open to the public where you may also view their tortoise breeding program as well as giant tortoises in captivity. 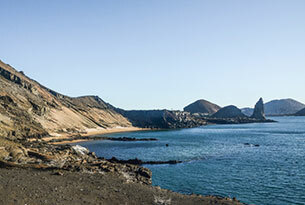 Here, you will get to enjoy one of the Galapagos’ most famous views: the tilted Pinnacle Rock, the golden beach of Bartolome and the impressive lava fields of Santiago Island. 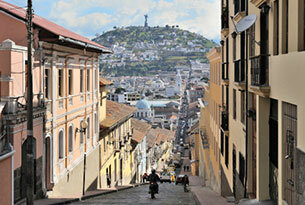 Upgrades to Casa Gangotena Hotel in Quito are $150 per person. 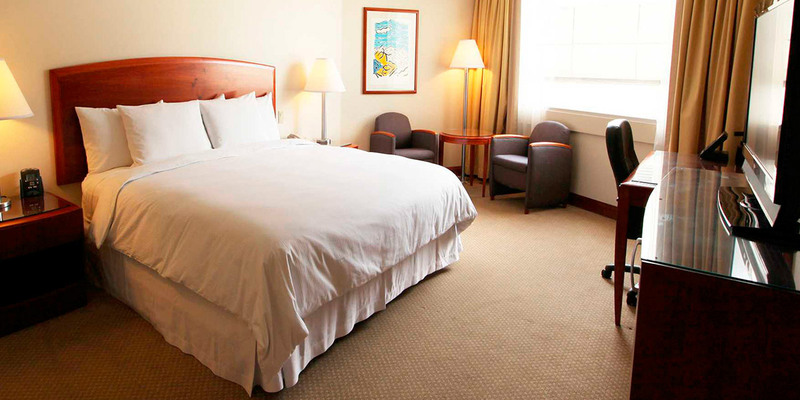 Upgrades to Finch Bay Suite are $326 per person. We stayed at Finch Bay for 4 nights, having chosen to do one of the all-inclusive packages. I organized everything by email with Victor, who was extremely helpful, and everything went perfectly, including the rather complicated transfer process on arrival! We didn’t want to do a cruise and thought that the combination of land and sea activities that Finch Bay offered would work well for us. Our guides were excellent. Henrique met us at the airport and took us to the highlands to see the tortoises, and we had a very pleasant lunch with him. We went to North Seymour Island on the resort’s yacht with Soto. The day included snorkeling with turtles and small rays. The yacht crew were really good too […] Our other land day was to Tortuga Bay and the Charles Darwin Research Centre with Valentin, it was very relaxed and a good change of pace. […]Breakfast was great, dinners were very good – limited choices due to the package but we had no issue – and Sabrina who was our waitress on a couple of nights was exceptional. We had a drink at the bar by the pool every evening – amazing passion fruit daiquiris, thank you Jorge! It is quiet at night, but it would be easy enough to go into Puerto Ayora if you chose. We were tired after the day’s activities, and happy to stay at the hotel. The ladies at the front desk were so helpful, and we were very well prepared by them every night for the next day’s activities. 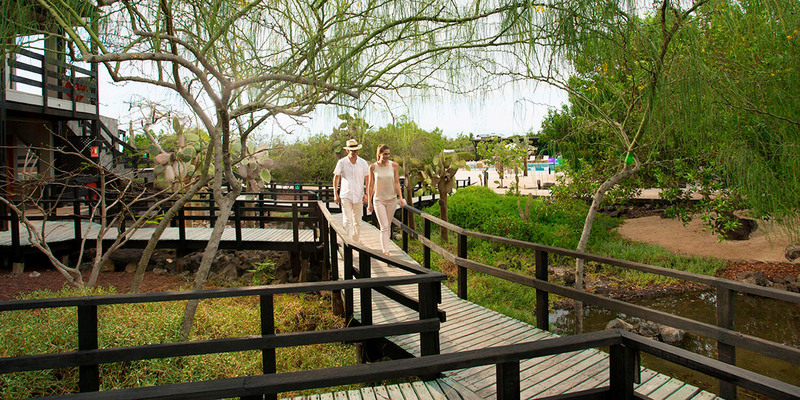 For us, Finch Bay was a great way to get a taste of the Galapagos.